T: dude i thought this was a really creative and innovative meal tonight. and damn it was tasty. A: thanks t! i can’t really take the full credit for this one. at the very beginning of my foodblog reading days I saw a wasabi pea encrusted tuna steak, and that was the inspiration for this dish. T: holy crap it was good. do you by any chance remember what food blog it was on? A: i really don’t. i wish i did, but it was so long ago that i saw it and you know… my memory isn’t what it used to be. i took that inspiration and ran with what i thought would work well with it – i schmeared the salmon fillets with whole grain mustard then added the wasabi pea crust and served it with the mustardy lemony cream sauce, poached bok choy, and skillet potatoes… just like dad used to make. T: dad used to make poached bok choy too? A: heheh no silly! dad used to make skillet potatoes just like that when i was growing up. really easy, just sliced potatoes pan fried with sliced onions and s&p. T: … OH! salt and pepper. T: that always throws me off, I think it’s some kind of sauce or something. A: we could make a s&p sauce, or at least call a sauce s&p in your honor since it confuses you. T: or not. thank you very much. back to dinner!… i have to say, the mustard is really what set it off for me. A: cool.. the mustard was inspired by a salmon dish we ate at a restaurant in Pacific Beach like a month ago. whatever dish you got at the time came with a similar sauce and i thought it rocked so… this was my attempt to recreate it. BTW, this is our FIRST meal in our new apartment in OB! T: it surely was nice! we have a terrible lighting situation that needs to be dealt with… ok, more than just lighting. well, we’ve only been here a couple of days. we’ll have plenty of time to decorate. A: we are definately in transition mode currently. working out the kinks and what not. i just know it will all work itself out soon. we’ll get there T! T: we sure will, A! golly. you’re swell. A: woah dog, what’s with all this crazy talk? you’re like a blast from the past, man. T: i was just feeling it. i don’t know why. jeepers. A: AGH!!!! Okay, well, back to the dinner at hand. I give this meal a 4.333/5. It was good. I enjoyed it and would order it if it were on a menu. But for some reason it wasn’t the most exciting meal i’ve ever made… still yummy though. T: I thought it was damn exciting. I give it 4.7/5. Truthfully, the only reason it didn’t get a higher score is because bok choy isn’t my fave. It kinda reminds me of celery. you know, like you expend more calories eating it than it gives you back. A: that could be true, i just don’t know. what i do know is that i thought that the bok choy offered a refreshing crunch to a mildly heavy meal and i enjoyed it. but i can totally see how bok choy could not be your fave. T: did somebody say chocolate? In a food processor, pulse the wasabi peas for 5-10 seconds or until they are roughly chopped, try not to over-process into a fine powder. Season the salmon with salt and pepper then schmear a layer of whole grain mustard over the salmon, except on the skin side, then dip the mustard coated sides into the wasabi pea crumbs. Sear over medium to medium-high heat in a large skilled with vegetable oil, skin side down first, 3-4 minutes per side or until the crust has formed a nice caramel color. It is important to to flip the fish before it is ready or else you will loose the crust. When the fish is ready to be flipped it will release from pan on its own and there won't be any resistance when you try to scoop it up with a spatula. If you go to turn the fish and it seems to stick to the pan, it's not ready to be flipped. This goes for anything you are cooking. When the fish is finished, remove from pan and set aside. Deglaze the pan with the chicken broth, stirring to get up all the tasty morsels stuck to the bottom of the pan. Reduce heat to medium-low and bring the broth to a simmer. Add the cream, milk and 4 tbsp whole grain mustard to the broth and wisk. Allow to reduce at a fast simmer until thick and saucy. 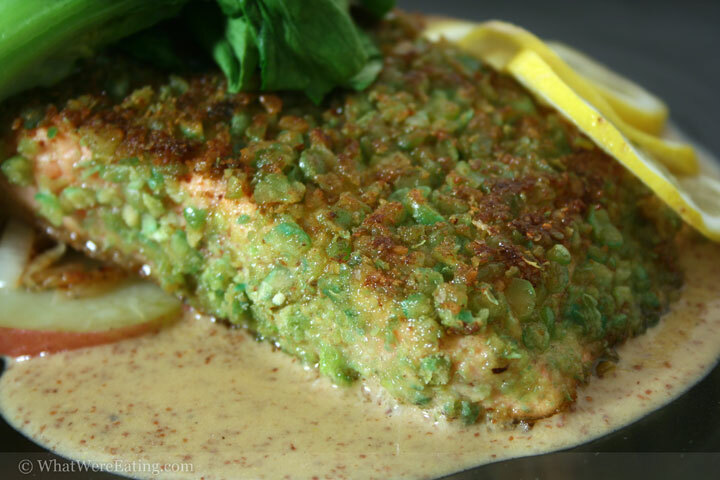 Serve the salmon in a pool of the mustard sauce and enjoy! Wasabi=Japanese,Bak Choy=Chinese seems pretty interesting. Congratulation to your new home! (: waiting to see some new pictures. I don’t know if you are familiar with egullet society (www.egullet.org) but in their forum they have one discussion with a lot of good pictures from self made dinners. (http://forums.egullet.org/index.php?showtopic=5867&st=14640) You should think about posting your pictures there. OMG YUM!!!!! that looks tremendous. i will make this! Honkman, we are not familar with egullet society but have since visited the site (thanks to you!) and will be add some of our pics there. Definately a great suggestion. Thanks! Easily Pleased, I don’t think you will be let down. It was quite tasty! I can’t wait to make this. So beautiful. So simple. So yummy looking! O_O Must… resist… eating monitor…..
now why are you trying to resist eating the monitor lea! they taste so good…all dusty and plasticy. Thanks! very creative! I have wasabi peas right now and will try your idea either on meat filet, or tilapia—Yum! Thanks melissa! I’m sure it will turn out great. you are a wonderful cook! Hi, This looks wonderful and I can’t wait to make it. Gonna try and then hopefully make for a client. Do you know if this would freeze well ? Chef Denise, I really don’t know if it would freeze well or not. I would imagine it would freeze as well as any fish freezes because those wasabi peas are already dried. I doubt they would have a problem freezing! I would love to hear how it goes, and if the client likes it! Thanks! wow. that looks so good.